ACTIVITIES: We live on a lake where my husband maintains a nice ice rink. However, if the lake had not been suitable for skating this year we would have transported the girls to one of our local outdoor rinks to skate and then back to the house for the rest of the party. The theme of the party is Figure-8 with an emphasis on the '8'. I found a craft activity at Oriental Trading called Sammy the Spider (eight legs on a spider). The bonus is that my daughter's name is Sam. I'm going to teach the girls to play the card game Crazy Eights. We're also going to play a game using the Magic 8-ball. I'm going to come up with some silly questions that I'll put in a hat. Each girl will draw a question read it aloud and then shake the Magic 8-ball for their answer. For example one of the questions will be "Will I have to squawk like a chicken?" I suspect this game will get lots of giggles. DECORATIONS: Since half of the party will be outdoors I'm only going to decorate the dining room. We found all of our table decorations at Party America. 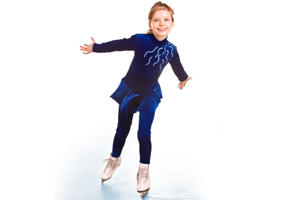 We found a turquoise-blue tablecloth that matched the color of the ice skates and 8's on the invitation. Her plates and cups have snowflakes on them in various shades of blue and white. While at Archivers we also used plain white cardstock and cut snowflakes in two different sizes and shapes. We'll hang these from the dining room ceiling at various heights using fishing line for a winter wonderland effect. We also found snowflake-shaped confetti in turquoise and silver. If you don't have access to a die cut machine you could also have the kids cut snowflakes from coffee filters. FOOD: I wanted to serve hot dogs since they come in packs of eight but Sam opted for pizza with a side of baby carrots and ranch dressing. I'll also set out a dish of snowflake-shaped Ritz crackers. For the drink we'll have icy blue Kool-aid or Gatorade. For the cake I will make two round cakes and cut the center out of each. I will put them together to make an '8' and then frost it. FAVORS: In the dollar aisle at Target I found a pack of Crazy Eights game cards. I also found Magic eight ball mini Frisbees at Oriental Trading and disposable hand/foot warmers at Mill's Fleet Farm. Finally I found a recipe where you cut brownies into the shape of the boot of an ice skate. You frost and decorate the ice skate brownie and then add a mini candy cane as the blade of the ice skate. They are super cute! I will make these wrap them up and include them in the loot bag."